NETBALL: The signing of a staunch defensive spark has completed the 10-strong Sunshine Coast Lightning squad for the 2019 Super Netball season. The club officially announced South African goal keeper Phumza Maweni as their newest, and final, addition to the team on Thursday at USC Stadium. 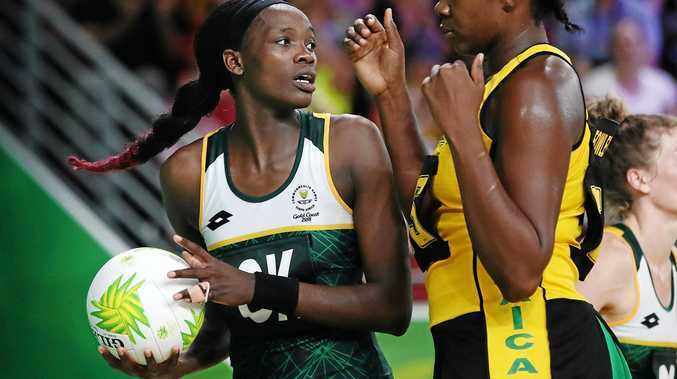 Maweni, who stands at 186cm tall, has played in the Vitality Netball Superleague in England in recent years and competes in the international arena as part of the SPAR Proteas. Maweni said she was looking forward to making the move to the Sunshine Coast and joining fellow Proteas player Karla Pretorius in defence. "Karla and I have trained and played together for many years, so I think that existing connection will serve us well when we compete for Lightning next year,” Maweni said. "It has been a dream of mine to come and play in Australia and I'm excited to be joining the reigning premiers. Lightning assistant coach Kylee Byrne said she believed the club had added a world-class athlete in Maweni and she couldn't wait to work with her. "We searched nationally and internationally for a circle defender who would complement the players we already have and who would suit the style of defence we play,” Byrne said. "We are over the moon to have Phumza joining us next year; watching her grow and get better each game in this recent Quad Series has been so exciting. "Her combination with Karla Pretorius was a huge drawcard for us and we believe she has so much potential to further her game in the Suncorp Super Netball competition. "Following her time with coach Norma Plummer and the South African national team and her last few years spent playing in the English Superleague, Phumza brings a great base to work with. Byrne said she was excited to have a mix of international players and Australian pathway athletes donning the yellow, purple and blue in 2019. "Six of our 10 athletes are products of Australian high-performance pathways, with five of these players having progressed through the Queensland system,” she said. "As with past years, it's great to be combining our local talent with skilled international players like Phumza who also bring a range of abilities and expertise to the court. Raised in Cala in South Africa, Maweni began playing netball in primary school using a homemade ball and limited kit. She went on to compete for KZN Kingdom Stars and Western Cape Southern Stings in the Brutal Fruit Netball Premier League in South Africa, and Loughborough Lightning and Severn Stars in the Vitality Netball Superleague in England. In addition to Maweni, Lightning's 2019 squad includes returning players Stephanie Wood, Laura Langman, Karla Pretorius, Laura Scherian, Madeline McAuliffe, Jacqui Russell and Cara Koenen, as well as new recruits Peace Proscovia and Annika Lee-Jones.